Smile with confidence and enjoy your favorite foods again! Dentures can be a viable way to replace loose, missing or damaged teeth. As with any medical procedure, patients who fully understand their options make the most informed decisions. That is why at River Towne Dental, dentures are carefully explained and compared with other tooth replacement options. Immediate dentures are placed immediately after the removal of your remaining or damaged teeth. Many dentures candidates are unaware that immediate dentures can let you go directly from natural teeth to dentures, so you will never have to be without teeth. 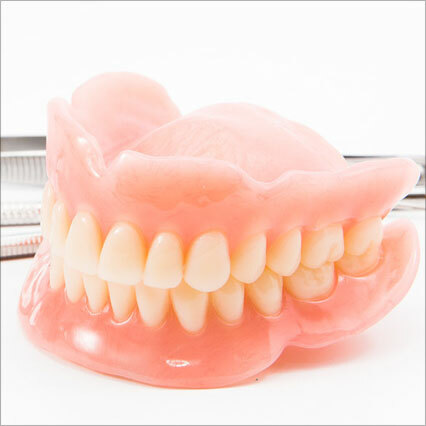 One of our most popular types of dentures is implant-supported dentures. This is when the highly-successful dental implants procedure is used in conjunction with removable dentures. Instead of relying upon denture adhesives, as few as two dental implants can hold your removable dentures firmly in place. If you've struggled with loose or ill-fitting dentures then an implant-supported denture can be the solution you've been looking for.